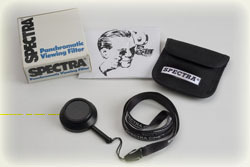 Spectra viewing filters permit visual judging and interpretation of a scene by compressing the scene’s brightness contrast-range to that of the film. Because the contrast-range of color film is shorter than that of panchromatic film, two types Viewing Filters are available – one for each emulsion. 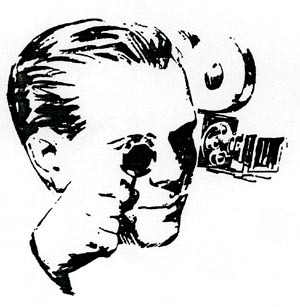 It is, of course, most important that the correct VIEWING FILTER be used with the film for which it is designed. When a scene is viewed through a VIEWING FILTER the brightness reaching the eye is reduced sufficiently to show not only the general appearance of the scene as it will appear on film, but also whether the lighting contrast is correct for the particular type of film in use. “Hot” areas that may “burn up” and dark areas that may be underexposed are more readily discernible through the VIEWING FILTER than with the naked eye. When looking through the SPECTRA VIEWING FILTER carefully check highlights and dark areas. If the shadows appear blocked up and lacking in detail, this is how they will appear on film, unless corrective lighting is applied. Do not try to lighten the shadows by increasing the exposure, as this is only likely to overexpose or “burn out” the highlights. The correct procedure is to reduce the lighting contrast and the simplest way to do this is to use a fill light or a reflector for the dark areas. Besides determining lighting contrast, the Panchromatic Viewing Filter also shows the effective tonal separation within the scene. Colors that seem to blend together when viewed through the Filter will, likewise, show no separation when photographed. If tonal separation is desired a suitable corrective filter should be used on the camera lens. Panchromatic viewing filter permit visual judging and interpretation of a scene by compressing the scene's brightness contrast-range of a Black and White film. Color contrast viewing filter permit visual judging and interpretation of a scene by compressing the scene's brightness contrast-range of a color film ISO 250 and lower. Color contrast viewing filter permit visual judging and interpretation of a scene by compressing the scene's brightness contrast-range of a color film ISO 250 and higher.